How have you all been? I’m three months away from my wedding and well, I’m feeling the heat. There’s a mountain of to-do lists and I’m now starting to get that feeling like I’m falling behind. This month I was unexpectedly travelling a lot and to be honest, I was neglecting this blog. I’m a lot more active on Instagram but I found myself failing there as well. Keeping commitment woes aside, I’m doing good and I hope you are too! I haven’t spoken about skincare for a while now. I would say I’m about a month behind in terms of posting. I still using the products below but they’re not so new and shiny anymore. The rest of my skincare routine is pretty much the same. It’s the monsoon season here and quite humid which means my skin is more normal-ish and I can’t really bring myself to use facial oils. That’s the only thing I’ve cut from my routine and everything seems to be going just fine. 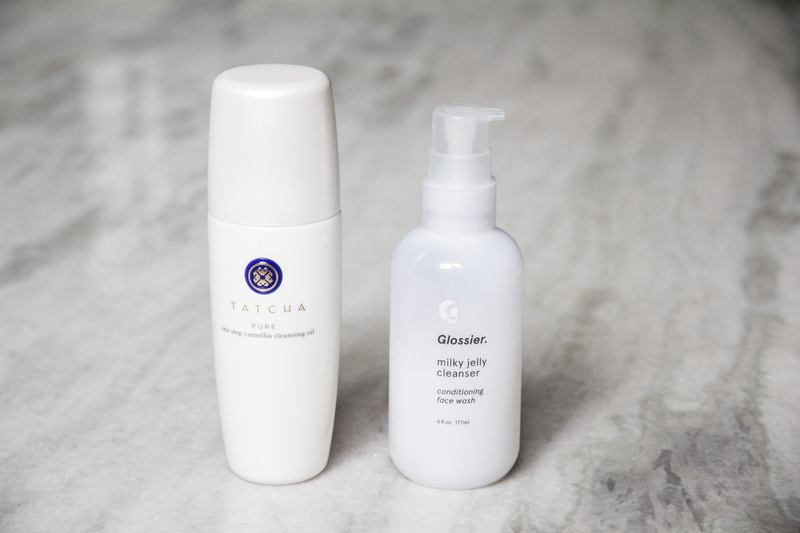 After using Banila Co. Clean It Zero Cleanser, a no nonsense sorbet textured cleanser which leaves no residue, Tatcha One Step Camellia Cleansing Oil had big shoes to fill. I will admit, it felt nice to use an oil consistency again and not deal with an oily tub. The packaging here is understated but elegant, doesn’t feel like cheap plastic. The oil itself is incredibly silky, a new feeling because while it is as runny as the Shu Uemura one, it doesn’t feel as dry. At the same time it’s not heavy like The Body Shop Camomile Cleansing Oil. It does take off heavy duty makeup with ease and doesn’t irritate my eyes. After rinsing, I don’t feel any residue either. Overall, it does everything it says and I can see why so many people like it. I’m just not sure if I’ll repurchase it because the price is a bit steep and I have other more affordable options available. Ever since it was announced, I was dying to try the Glossier Milky Jelly Cleanser. I was always interested in Glossier but the cleanser was enough motivation to jump through hoops to get this. The cleaner itself is unlike anything I’ve tried before. Milky Jelly is a perfect description and I love that this can be used wet or dry (like an eyeshadow). On dry skin, the gel textured cleanser feels almost hydrating and soothing. There’s a lot of slip to it and at times you might feel like it’s just moving on top without actually working through the dirt but you can see the difference once you add water. It doesn’t turn milky as much as I hoped it would but it takes off the majority of my makeup. It does take a few rinses to take the cleanser off completely, much like removing conditioner, it’s that same kind of feeling. Apparently this also contains contact lens solution which means it’s very gentle on the eye. If you’re into rose scents you’re in for a treat. I’m not too fond of it, but it’s not a dealbreaker for me either. Overall, from the packaging to the formula, I love it. While this can be used to take off a decent amount of makeup, I don’t find it very thorough and hence, it’s my second cleanser of choice. I would love to repurchase it if Glossier started international shipping. 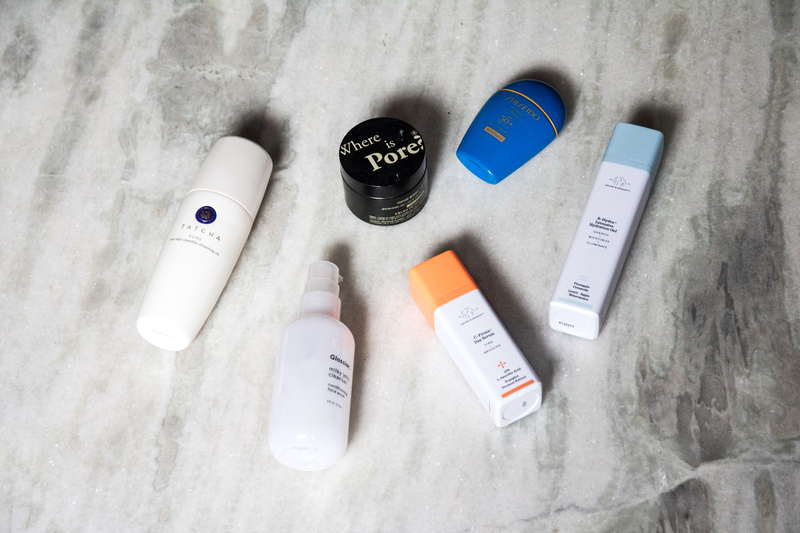 Drunk Elephant is a brand I’ve wholly embraced because of the brilliant packaging and formulas that contain no alcohol or irritant ingredients. They just seem to work really well for me. I started using this Vitamin C serum earlier in the year and well, it’s worked wonders at reducing hyperpigmentation and leftover acne marks. Naturally, I repurchased it! 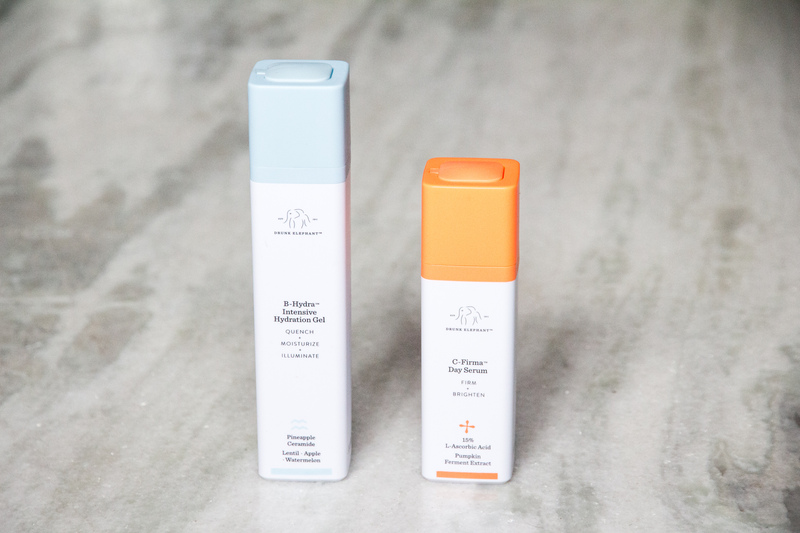 Drunk Elephant C-Firma Day Serum has been a constant for me this year and my love for it is well documented on this blog. But let me run you through it again! It contains Vitamin C (known for badass brightening properties) and Ferulic Acid (which in combination with Vit C makes it more potent in fighting of free radicals). Unlike other such serums which often come in droppers and are useless after 3 months (thanks to oxidization), DE lasts longer because of the formula and very clever packaging. I wanted to try something else from the brand and they had just launched the Drunk Elephant B Hydra Intensive Hydration Gel. This is a game changer. My skin feels more normal and I actually can’t stand using oils or heavy moisturisers. Even a light one like the Kate Somerville Goat Milk Cream makes me look shiny. There’s nothing better to use than a lightweight hydrating gel in this situation. Now I’ve used moisturisers in gel form before, Clinique Moisture Surge something and I didn’t like it at all. It felt like there was a film over me and it never sunk in. B Hydra is different though, it’s a light gel but it absorbs into your skin within minutes leaving you feeling very fresh and hydrated. Apparently, it’s because it’s a water based formula that doesn’t contain silicones. On most days I wear just this during the day and I don’t need anything else. That might change as winter approaches but this is another product from DE that’s on my repurchase list. I also have the Belif The True Cream Aqua Bomb awaiting it’s trial but I’m interested to see if the effect is similar. 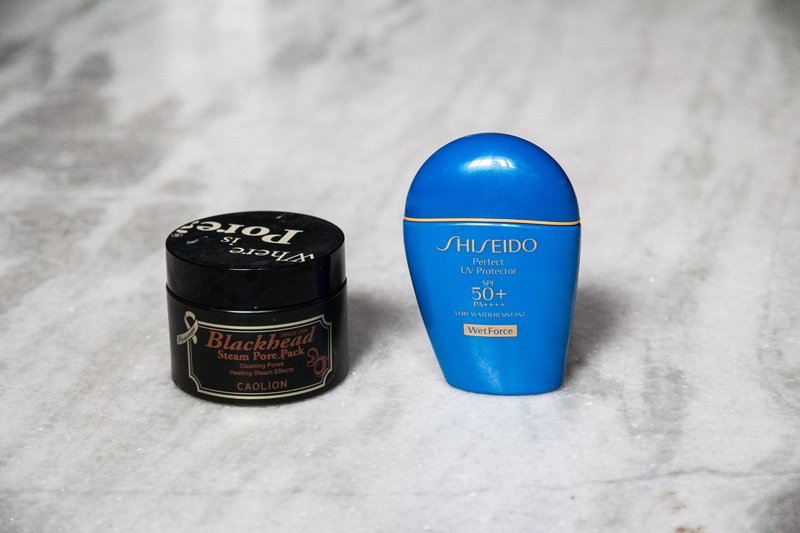 I love going down the Korean beauty rabbit hole, because then I discover products like Caolion Blackhead Steam Pore Pack. So settle down for this, it’s a grey charcoal mask. Sounds basic to begin with but when you put it on, it feels very fluid and granular. Then after a minute it starts to heat up,which can freak you out the first time but you need to be brave. It’s not a scalding burn, more like a very warm washcloth. After 5-10 minutes the heat subsides and you suddenly realize that all this while the mask hasn’t dried or felt like your skin is being stretched thin. In the end though, you’re left with gloriously super clean and brightened skin and it all feels worth it! I will say this, I found the heating effect to weaken after a couple of uses. I suppose the packaging needs to be more airtight or maybe it’s an ingredient thing. My final addition is a sunscreen! I’ve changed my sunscreen after many years and I’ve upgraded for the better. Now I still think that for the price, Neutrogena is good with it’s matte finish but the Shiseido Perfect UV Protector SPF 50+ (Wet Force?) is better. It’s very runny, lightweight and feels like there’s no additional layer. I wore this is in 35°C heat in Jaipur recently and it stayed strong throughout the day. This does contain a bit of alcohol which isn’t ideal but I haven’t had any reaction to it so far. It also contains a mild floral fragrance similar to the Neutrogena one. I might try the sensitive skin version next and decide which one I like better. Let me know what you’ve been enjoying skincare wise! Hope all of you have a great month ahead!